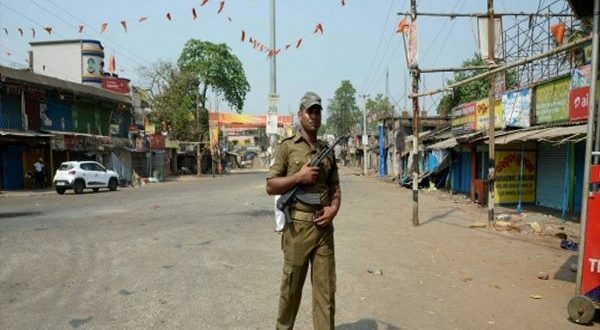 Bhubaneswar: The Bhadrak district administration on Sunday relaxed curfew for the smooth celebration of Rama Navami in the town. The restriction has been relaxed from 12.00 noon till 10.00 pm to carry out Sankirtan and procession on Ram Navami in the town. The imposition of Section 114 has been in force in the town for over a week now. According to reports, an ambience of peacefulness has been created all over the town when hundreds of visited many Puja Mandaps and offered prayers to Lord Ram on the auspicious occasion of Ram Navami. As many as 50 platoons of the police force have been deployed to ensure smooth conduct of the Hindu festival. As many as 70 Medhas would move in a procession amid chanting of Sankirtan (presentation of devotional songs with the beating of cymbal and mridanga) in the town as part of the celebration. The Bhadrak district administration suspended internet services for 48 hours starting from 6 PM on Saturday so that rumour mongers cannot operate social media platforms which help in fanning communal tension.